In hospitals and nursing homes in Japan, disabled people are learning to walk again by wearing a robot suit. HAL, the Hybrid Assistive Limb, is strapped to one or both legs. In “Cybernic Voluntary mode”, HAL picks up bio-electrical signals from the skin that are generated whenever the brain tries to move muscles, interprets what its user is trying to achieve, and moves its joints in support. If muscular or central nervous system problems mean that no signals reach the skin, HAL can be used in “Cybernic Autonomous mode”, drawing from a database of coordinated everyday movements such as standing up, sitting, walking and climbing stairs. HAL’s potential applications include use as a neuro-rehabilitation device for patients who are recovering from a stroke or who have a disease of the brain or nervous system, and helping the elderly and disabled to regain or maintain autonomy in their daily activities. 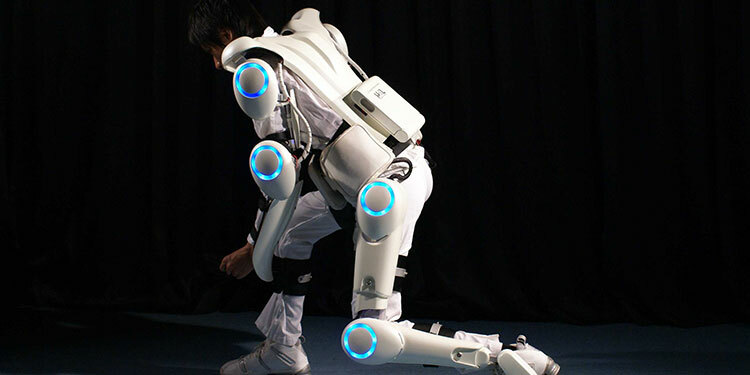 Beyond the medical field, a version of HAL which also includes the upper body is capable of supporting heavy lifting, and Cyberdyne envisages that it could be used by workers in factories, rescue operations and even care workers lifting patients. Until recently HAL was only available for hospitals and nursing facilities in Japan, but is now entering mass production ahead of being rolled out worldwide. Cyberdyne is developing more compact versions of the technology to use with only one joint, and envisages a future in which it becomes routine to wear robot exoskeletons to help with daily tasks.